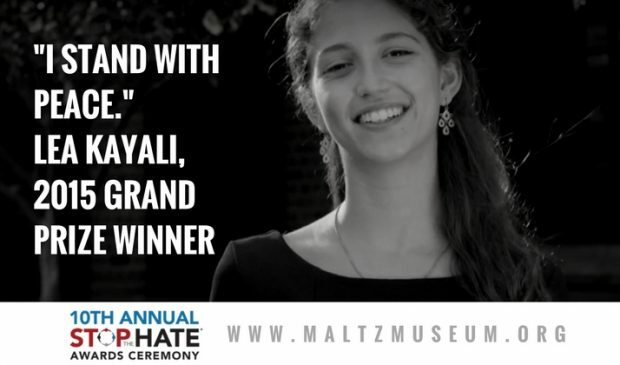 In 2015, Lea Kayali was the seventh Stop the Hate® grand prize winner. Read her essay below and register for the awards ceremony HERE. I am Palestinian but I am not the enemy. This disclaimer is all but necessary when introducing myself. Unfortunately, I have been conditioned into prefacing “I am Palestinian” with “but I am not…” because I’ve come to understand that the word Palestinian is attached to a whole caravan of negative attributes. Put simply, I have been told, time and again, that I am the enemy. Even as a child, it’s impossible to be ignorant of this as an Arab-American in a post 9-11 world. To my dismay, this scene was not an isolated incident but the first in a string of my interactions with discrimination. I’ve witnessed intolerance in the form of the kids who vandalized my friend’s house with anti-Arab slurs, spiteful social media posts, and more. I was amazed when someone told me to my face that all Palestinians were the singular, unforgiving “problem,” the antagonist of the world stage. Naturally, not all of my interactions with strangers result in a display of prejudice, but the scenarios I described are not obscurities. In addition to anti-Semitism, racism, and homophobia, I believe that the blatant discrimination against Arabs and Muslims will soon be a scar on our nation’s history. In what often feels like an infinite storm of injustice, one word gives me hope in humanity: connection. To prevent the intolerance that’s all too prevalent in our society, I’ve taken a stand. This summer, I posted about my desire to counteract the hatred that accompanies the Israeli-Palestinian conflict, branding myself with the hashtag #IStandWithPeace. Furthermore, I’ve given speeches about the conflict in classes, and I am a leader of my school’s 300-member human relations group. Perhaps most importantly, I’ve joined an Israeli Culture Club where I get the pleasure of learning more about Jewish-Israeli life. It’s encouraging that I’ve found solace with many of my Jewish friends who have also been touched by the war in Israel/Palestine and have the insight to look past our ethnic boundaries. Priceless cultural exchanges can be disguised as daily interactions. I’ve had people tell me that through me they saw that their perception of Arabs was untrue. From these small connections I came to understand that to combat discrimination the best plan of action is interaction. My goal is to spread respect one human connection at a time, for I believe that interpersonal relationships are the best way to promote peace. To turn Stalin’s famous quote on its head: a million people are a statistic, but one person’s story is a lesson. I have realized that it doesn’t take much to debunk these harmful stereotypes. Thus, I am passionately driven to continue my peace activism in the future. I am Palestinian but I am not the enemy, and to stop the hate, I Stand With Peace.